This was one of the coolest things I have ever seen in my life. The Norwegian band WE, put together two sets of music (65 and 45 minutes) to this Swedish silent film from 1921. This was a special event for the pre-opening of this years Öyafestival. They wanted to do something different and Thomas the singer from WE suggested WE perform to a silent film and suggested this one. Everyone thought it was a great idea. 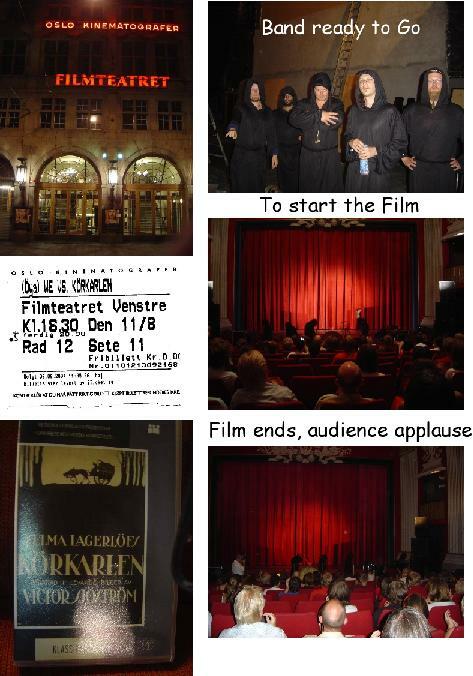 He has this old video tape that the band worked from but it turned out that the Swedish Film institute had recently made a new refurbished version of this classic in 1999. The video Thomas had was only 79 minutes and this was 109 minutes long! The band had to work up an extra 30 minutes of music. Anyway, for 75kr (if you had a pass for the festival) or 150kr, you could see WE perform to the film in this classic theatre (and free beer - not advertised!). It was a full 8000 watt PA and incredible sound. About 300 people were at the showing. The band comes out dressed in black hooded costumes. The bands performance was outstanding. You heard parts of some of their songs used in the music (Chase Vampires, 1971, Lucid, Stuks of Khun de Prorok). The music starts very eerie and they play some cool Pink Floyd like stuff. The new WE member, Jan plays some cool Rhoades piano. All the text is recited in English by Thomas with some cool vocal effects and delays on occasion. He really gets into the characters and it is totally amazing. There is a break in the middle. Everyone I talked to thought this was an amazing event and totally unique to have heavy rock music played to an old classic silent film. This is a very heavy film about a women who is dying and David Holm, a very nasty, bitter, mean person and their meetings with the grim reaper and the phantom carriage. A mind blowing movie and way ahead of it’s time. By far the best silent movie I have ever seen. What a way to start the festival!